Weapons control is a hot topic in the United States. With the recent shooting in Florida in February 2018, discussions of gun control are at an all-time high. Yet this discussion is not limited to the US; with the age of media, there has been an influx of reporting on violence as well, and the debate regarding weapons control has spread worldwide. Gun control is the primary topic of interest, and because of this, one might wonder whether previous cultures ever experienced a need for rules regarding weapon holding. Of particular interest is whether the idealized culture of ancient Greece met with this same debate. In ancient Greece, (and of course its close Egyptian, Hittite, and later Roman neighbors), weapons were a prominent aspect of life. War was a consistent threat—whether from an exterior source or from within. Weapons were often kept nearby, or on one’s person, and leaders were always—even now—protected by some form of guard. Weapons are not a new topic of conversation. Interestingly enough, conversations on weapons control are not new either. The ancient Greeks, to whom the United States has often turned for guidance in various affairs, are one of the earliest known examples of enforcing weapon control. Once again, due to the constantly changing nature of pre-democratic Greece, and the various wars in which the Greeks played a prominent role (the Persian Wars, the Peloponnesian Wars, the Pyrrhic Wars, etc. ), weapons were intricately tied into Greek culture. However even the Greeks saw a limit to the necessity for weapons within a civilized state. Weapons were bought and owned by the rich; for one to participate in most Greek armies (as they were individualized by city-state) a soldier needed to possess enough money to buy their own swords, shields, spears, etc. In essence, weapons could be considered synonymous with wealth. Men could sport weapons freely in wartime, and could have an unlimited (as far as research can tell) number of weapons in their homes; there is no record of a limit to the number or types of standard weapons. However, the Greeks did set a limit on the prominence of weapon exposure in ancient Greece. Knelt warrior with de-cladded sword – possibly Achilles waiting for Troilus. Tondo of an Attic black-figure kylix, ca. 560 BC. 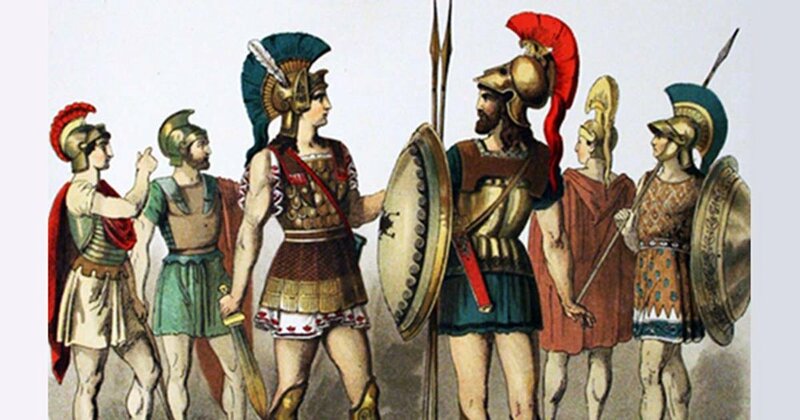 ( Public Domain ) Greek warriors had to obtain their own weapons. Evidenced in literature from the Archaic period forward (800 BC–480 BC), men could not enter the agora, or marketplace, with a knife strapped to their waists; men could not walk into any form of religious space with a sword, other than a ceremonial one (usually carried by the presiding priest). Further, men could also not enter any form of political space with a weapon. In fact, this point has long been punctuated by the story of an ancient Greek man called Charondas, the same man who demanded that a law be put into place banning the carrying of weapons within the Assembly (political body) of the Greek colony of Catania in Sicily. Charondas, as the story goes, insisted that all those who entered the Assembly must leave their weapons outside the political center of the city; in most city-states, this Assembly was located in or near the agora. However accidents happen; with weapons, accidents often lead to death. Unfortunately for him, even Charondas was not exempt from this fate. Returning to the Assembly after spending some time out of the city, Charondas forgot to swing by his home and leave his own weapon (which he was carrying for protection during his travels) there. Upon entering the Assembly, his mistake was realized by his associates, and he was ridiculed for forgetting his own law. To prove his dedication to the law, he rectified his error by removing his dagger from his person and committing suicide. Charondas’ dedication to the protection of the members of the Assembly is undeniable. The importance of maintaining a community free of threatening articles is also undeniable. There are various pros and cons to adopting and adapting ideas from the social and political world of ancient Greece. As weapons are currently a hot topic, perhaps there might be some interest in opening a discussion regarding the control of weapon possession and use in the ancient world. After all, many modern democracies drew initial inspiration from the ancient Greek δημοκρατία; now might be an important time to revisit those earlier values.